“Good morning ladies and gentlemen. Welcome to Delhi International Airport where the time is 0320 and the outside air temperature 36°C (97°F)” …WTF!!! I was on my way to Manali, set amongst the foothills of the Indian Himalaya where I was to spend the summer working with Blazing Trails Tours as an outrider and ‘trainee’ tour leader. I’d first met the owners Damon and Suzie I’Anson when I rode through the region back in 2006. They weren’t a couple then but the three of us were brought together by the annual Raid-de-Himalya, the worlds’ highest motorsport event. Damon and I were both competing and soon formed a bond that saw us preparing our bikes together and sharing a room during the event. 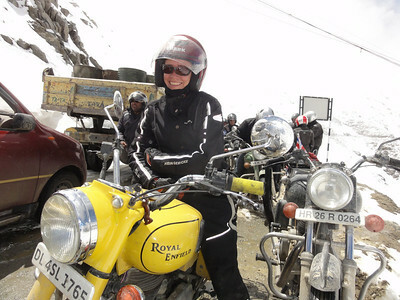 Suzie worked as an official on the raid but we had met previously on the Rohtang La (Pass) above Manali where I was riding a recce for the race and she was leading a tour on her fleet of Royal Enfield motorcycles. 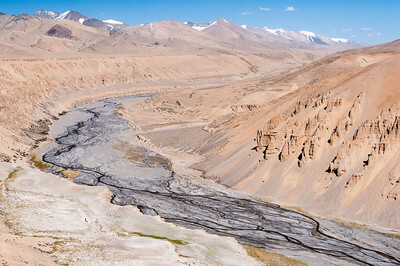 I wrote about my experiences in Chapter 8 calling it “Ladakh: The Best Motorcycling in the World? ” and so when Damon contacted me in 2011 asking if I’d like to combine my future travels with a job with them I jumped at the oportunity. 2012 was always going to be a year of transition. After 6 years on the road I had a lot of kit that needed replacing, the preparation of Rosie’s replacement to finance and an extremely depleted savings account to replenish. How I was going to achieve that I never knew but I did know that Damon’s offer was the first piece of the puzzle. After selling Rosie in the US in May 2012 (Chapter 29) I flew to my sister’s in Jersey, Channel Islands and dragged Lady P (my BMW F650 that I began this journey on) out of the garage. With fresh oil, a new battery and a little TLC she fired up and carried me onto the ferry to Poole and the 45 mile ride to my hometown of Andover where friends were waiting for me at a welcome home party in the Station Hotel pub. “So how long are you here for?” everybody asked. “Not long” was the answer. I had four weeks to carry out maintenance work on my house, visit friends and pack for India. Having traveled from Delhi to Manali with the first group of guests I was thrown in at the deep end when we set out for Leh two days later. It was the first time I’d ridden an old British bike and the right-foot gear change with ‘upside-down’ configuration took some getting used to. (It was several days before I stopped standing on the rear brake whilst thinking I was changing into top gear!). For those of you who don’t ride motorcycles, the gearchange on a ‘modern’ motorcycle is operated by the left foot in a 1-down (1st gear), 4 or 5-up pattern (depending on how many gears the bike has). For those who drive manual (stick) shift cars, riding with the British configuration is akin to putting 1st gear where you’d expect to find reverse and replacing 1st gear with top gear. Got it!? Somebody within the group had either brought a bug with them from the UK or picked something up in Delhi; either way it spread through the group like wild fire. Some were effected worse than others and for one poor chap (who’s identity will be kept to those present) who walked with the aid of a walking stick, we ended up cutting a hole in the top of a plastic stool so he could squat in comfort! 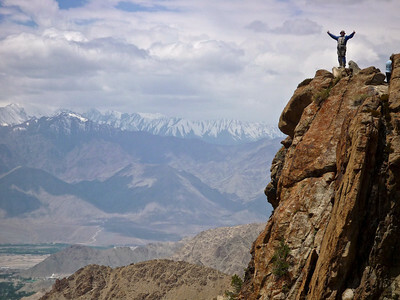 It was too early in the year for the Wiri La to be open and so we had no other choice but to re-cross Khardung La – ‘The Worlds Highest Motorable Pass’ ? It was early summer but as we sat drinking chai at the foot of the pass so we could see a storm brewing. Soon everyone was donning an extra layer for the climb to 5340m (17520ft). Yes, the sign at the top does read 18380ft but it isn’t! Gridlock in 3″ of fresh snow 5300m+ up a mountain and Suzie’s still smiling. After 13 years at the helm of Blazing Trails noting fazes her! It wasn’t long before we reached the snow line and soon after the backed up traffic. 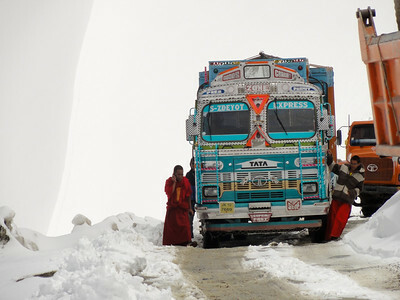 Trucks were stopping to fit snow chains, cars were abandoned and to top it all an Army convoy was heading towards us. Blaizing Trails stop for nothing though (well, almost nothing) and despite several delays we made it over the summit in 3” of fresh snow. Just forty minutes later we were drinking chai in the sunshine and gazing back up the mountain at the still raging snowstorm. If ever there was a lesson in not heading into the mountains unprepared, that was it. As the first group departed so the second arrived. This was the tour that was featured in Motor Cycle News (UK) on October 24th and more recently The Daily Telegraph. 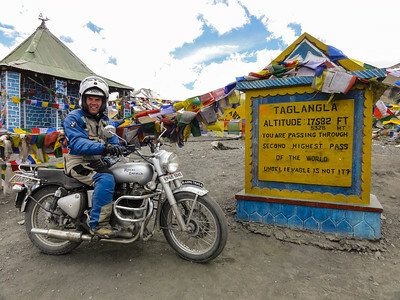 The Bennetts Insurance ‘Living the Dream’ winner Peter Stilwell had chosen the Indian Himalaya as his dream destination and it was our job to ensure he lived it. Along with his best mate Vince Stephens, Bennetts had sent author and journalist Geoff Hill to cover their story. Geoff and I shared a room for the two weeks and a more unlikely pairing you couldn’t wish to meet. Towering over my 5’4” frame was the 6’7” one-eyed blond Irishman! Now Geoff isn’t just a motorcycle journalist, oh no….he’s also the author’s the Ulster Joke Book and promptly subjected me (and the rest of the group) to a fortnight of one-liners! Feck! 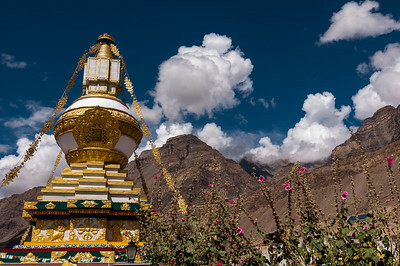 The first week took us west along the main road towards Srinigar, stopping at Lamayuru Monastery before turning south at Kargil to enter the remote but spectacular Zanskar Valley. A day on the dirt in and day on the dirt out, punctuated by a day off in Padum. During our day off we all took a short ride east to Stongdey Monastery. 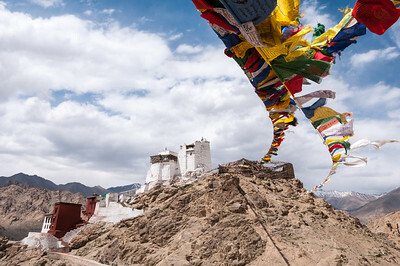 It was Buddhist festival season in Ladakh and by chance we arrived to find the monasteries’ festivities about to commence. I’d previously attended the famous Hemis Festival which whilst spectacular was crowded. This was the same but of a much more intimate nature and afterwards we were invited to take tea with the monks in the Dukhang. It wasn’t just the monks who welcomed us warmly. The locals both young and old were fascinated by our attendance. The team have a lot of experience in the region and it wasn’t long before they noticed the signs of malnutrition and an impromptu clinic soon sprang up out of the back of the support vehicle. Doctor Salim suddenly found himself treating a queue of locals for a range of ailments, a task he relished. As Salim worked his way through the patients so a local woman beckoned me to a house in the compound. 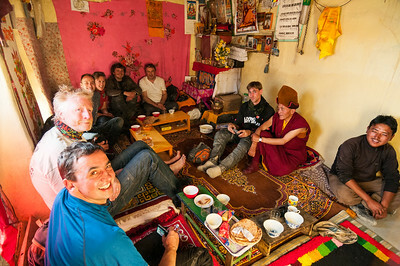 I’d been so engrossed in taking photos that I hadn’t noticed most of the guests had disappeared so imagine my surprise when the woman led me upstairs and into a room where everyone was sitting, taking tea with the Rinpoche (Incarnate Lama). It was a day that will remain in the hearts and minds of all those that were present forever: an incredibly moving day that culminated with Geoff taking on the sponsorship of a young girls schooling. If I remember correctly that takes the tally of young children sponsored by Blazing Trails and their previous customers to nine. 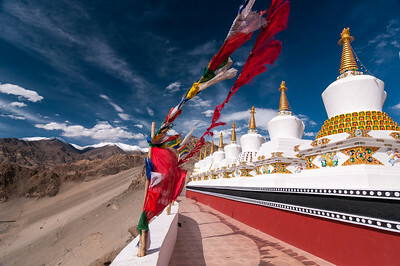 All three High Himalaya tours share the Leh – Highest Pass – Nubra Valley – Pangong Tso – Thiksey itinerary and so once again we left camp in the Nubra Valley and headed SE, passing the road to Leh via Khardung La. As the summer progresses so water levels rise relative to snowmelt so there was no point in even attempting the river crossing I referred to previously. Instead we headed for the third and final exit from the valley, the 5305m (17405ft) Wiri La. This route was only officially opened a few years ago and so doesn’t appear on many (if any?) maps. There was a distinct lack of oncoming traffic and sure enough as we reached 5000m so we could see across the valley to where the road was still blocked with snow – or was it? From 300m away it looked impassable but when Damon and I took a closer look we could see the shape of the road cut into the mountainside, albeit buried under a blanket of snow. As we discussed our options so a bulldozer appeared on the ridgeline and within an hour it had cut a path to where we were standing. Now when I say ‘cut a path’ I mean just that and not ‘cleared the way’. We were still faced with another 300m of vertical gain over the next 2km, all on a 10” (25cm) bed of snow. Some customers had never ridden on a gravel road prior to the tour, never mind faced anything like what lay ahead of them then. Peter had proven to be a more than competent rider and was one of the only ones that managed to ride a bike to the summit. The rest of the bikes were relayed over by myself, Damon and Ramji (mechanic). The top layer of snow had been torn up under the tracks of the bulldozer and was rapidly turning to slush under the brilliant sunshine. The rock too was warming up and melting the snow from underneath and creating huge, freezing puddles. The running water soon created ‘ice ruts’ on the steeper sections that didn’t bode well for the relatively low footrests. Just below the summit we had to negotiate a broken down truck that was blocking the road. Easy enough on the bikes but we also needed to get the Mitsubishi Patrol support vehicle through along with the jeep carrying all the luggage and spares. Being something of a demon behind the wheel it wasn’t long before Suzie appeared in the 4×4 but the jeep would have to wait for the bulldozer to tow it to the summit. There was no room to get passed the truck and so we set about shoveling snow and moving rocks but even doing what we could meant the Patrol would be tilted at 45° towards the truck. Still without quite enough clearance we consulted with the driver (who by then had appeared on the scene) before unbolting the trucks’ front bumper and gaining 15 vital centimetres (6”). Suzie squeezed by and we headed downhill to a very well earned tea stop. It had taken us 3 hours to ride 2km. The situation had pushed most beyond their comfort zone (not least because the whole episode took place above 5000m) but everybody mucked in to generate a real sense of teamwork. Those that didn’t ride pushed and pulled, shoveled snow and moved rocks. There was a lot of back slapping and a real sense of personal achievement. Other than the bulldozer driver we were the first to cross Wiri La in 2012. This was a repeat of tour one but run in the opposite direction and given the small group size and my knowledge of the region, Damon & Suzie left me to lead the tour and returned home to Manali. I wasn’t alone of course. I had transport manager/head mechanic Jamal with me along with Salim, the tour doctor. 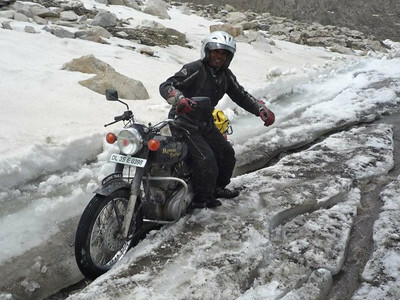 Jamal has ridden every Blazing Trails tour since he joined the company 12 years ago and during those years he’s encountered just about everything the Himalaya can throw at a traveller. For me it was a baptism of fire. On day three, on the backside of Chang La at 5300m (17400ft) a customer – Rob Murray – fell whilst riding at walking pace – and broke his leg. 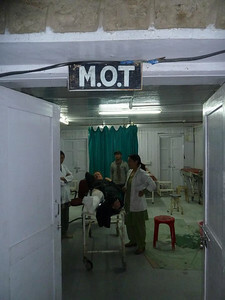 Six hours from the nearest (but ill equipped) hospital in Leh it could have been nasty but thanks to a team that knew how to deal with such a situation it wasn’t. We quickly had Rob on a stretcher and a bowl of plaster mixed. Whilst the other guests kept Rob as distracted as possible Salim (having jabbed Rob with a painkiller that would stun an Ox) twisted his leg back into shape before leaving me to hold it in traction whilst he applied a temporary plaster back slab. At least the weather was on our side! Once Salim could be left alone to finish treating Rob the rest of us reloaded the jeep such as to allow the stretcher to be loaded and Salim to sit next to it. As the jeep set off slowly on the long ride to Leh so Jamal and I began our relay of Rob’s bike. Taking it in turns to park a bike and ride pillion back to Rob’s we eventually left it at the Army base on the south face of the pass. By sheer chance Salim had stopped at the Army base to check on Rob’s condition at the same time as a holidaying orthopedic surgeon had stopped to find oxygen for his wife. 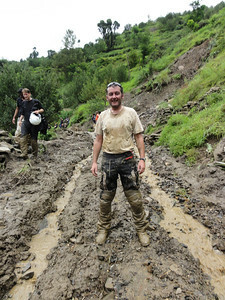 Rob managed a smile throughout his ordeal – top bloke! 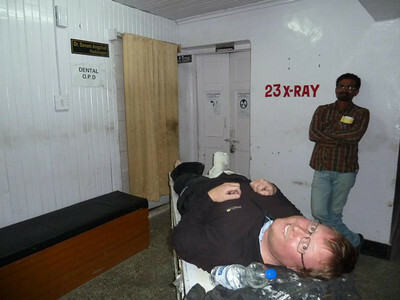 He examined Rob and being familiar with the facilities available in Leh, recommended he should be transferred to Delhi for surgery as soon as possible. It was late when we arrived at the hospital and the Radiologist had gone home so we waited outside the locked doors for him to return. When he arrived he did so alone and so it was down to Salim and I to get Rob on and off the table. As we pushed Rob back to the waiting area we took a peek at his x-ray. Even to my untrained eye I could see three breaks. The official line was ‘Multiple Fracture Tib/Fib’. Back in the waiting area we had to await the arrival of another doctor who was to replace the temporary back slab with a more substantial one for his transfer to Delhi. Short staffed, both Salim and I lent a hand in replacing the plaster. Whilst all this was going on I had been talking to Rob’s insurance company in a bid to arrange an air ambulance. It was gone midnight when Rob was finally discharged. There was nothing more the hospital could do and with bed space limited it was decided we could look after him better back at the hotel. Jamal and the other guests were waiting for us when we returned which was a good thing as Rob’s a big lad and took some lifting! The following day we recovered Rob’s bike from the Army camp and loaded it into the jeep. By lunchtime we had confirmation that the air ambulance would land in Leh at 0900 the following morning and set about finalizing his paperwork and finding transport to get him to the airport. Early the next morning we loaded Rob (still on his stretcher) into the back of a hired jeep and headed for the airport. Everything had gone surprisingly smoothly until then but not arriving by ambulance gave the airport authorities a problem as private vehicles are not permitted on the runway. 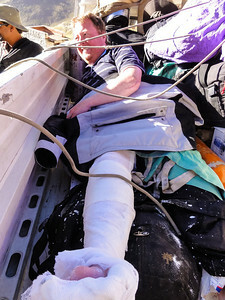 Initially they wanted to move Rob by wheelchair but with his leg in plaster up to his crotch and his medical notes stating that it must remain elevated, that wasn’t an option. The Delhi based co-ordinator for the insurance company had told me there was no ambulance available in Leh and asked me to arrange transport but try as I did to explain that to the airport authorities they just wouldn’t accept our jeep! This dilemma went on and on. The air ambulance arrived and the pilot said his piece, the airport manager said his, the security chief said his and so it went until finally someone saw sense and cleared the jeep to drive to the plane. The air ambulance had been on the ground for 40 minutes. With Rob safely in the air the rest of us set off for Manali. I’m pleased to say the surgeon and staff of Artemis Hospital conducted a highly efficient and successful operation that allowed Rob to return to the UK on his original return flight. He’s back at work and saving hard for a return….ain’t that right Rob!? 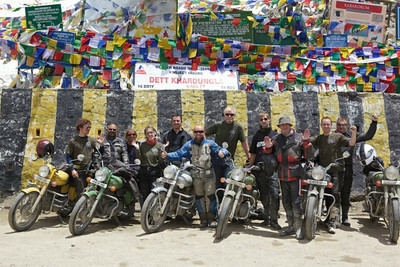 After a three week break in Manali we welcomed the guests for the Spiti Valley tour. 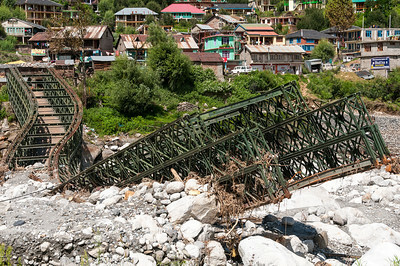 Heavy rain and localized cloudbursts had done some real damage in the locality including washing away this bridge just a few miles up the valley from Manali. Day two of the tour saw us cross the Jalori La. 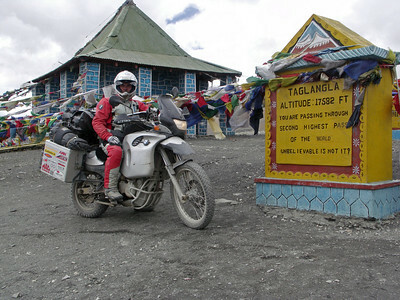 At 3134m (10280ft) it’s not high by Himalaya standards but the weather hits it hard. The heavy rains had blocked the main route on the south side with a landslide but Damon and I knew an alternative route that we’d ridden on the Raid back in 2006. After chai on the summit we headed downhill on a reasonable dirt road until we reached the turning for our detour. Here the track deteriorated into mud, ruts and rocks that made for a challenging but fun descent. Our first indication that this route was also blocked was when we rounded a corner to find an Australian tour group sitting around with their helmets off. Ahead lay a mudslide that was about 40m long with a consistency of slurry. As we walked across to recce the situation we discovered it was knee deep in the most part but only calf deep and a little firmer on the valley side. Damon broke out the ‘pulling’ rope that allowed six people to pull one bike and soon we were dragging bikes through the quagmire. Two of the other group mucked in to help but the rest sat around either slack jawed or taking photos. We offered to get them through to if they helped us but their tour leader didn’t seem interested. Of course, being so busy with the bikes nobody took any photos of the slide but here’s Damon on a decent stretch of track further down. Good to see a company director getting his hands dirty! 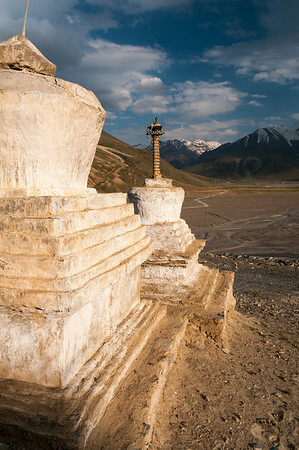 The tour heads east towards Tibet before turning north then north-west into the Spiti Valley. Often unpredictable due to landslides we had a clear run through and over the Kunzum La (4590m/15060ft) into the Lahaul Valley before returning to Manali via the Rohtang La. My final tour was the inaugural running of the ‘Himalayan Foothills’. 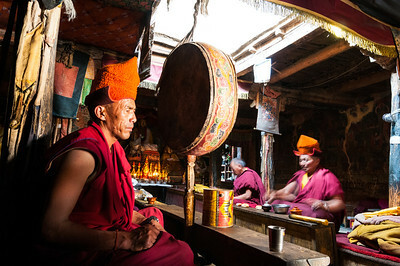 As the name suggests it doesn’t reach the heights of the other summer tours but it does offer endless curves and culture as well as a more regular higher standard of food and accommodation than is possible in the high Himalaya. It started in Shimla where Damon and I had prepared our bikes 6 years previously and despite the miserable weather it was a joy to wander among the market stalls through the back streets. On the first day of the tour it rained…and rained…and rained. 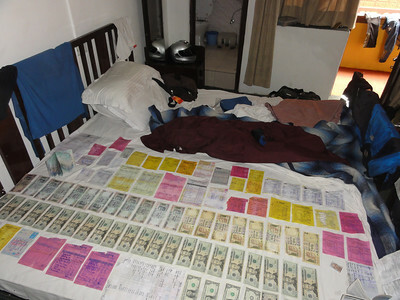 It rained for so long that things got wet that had never got wet before and I spent my evening before dinner peeling apart bank notes, receipts and my passport in a bid to dry it all out. 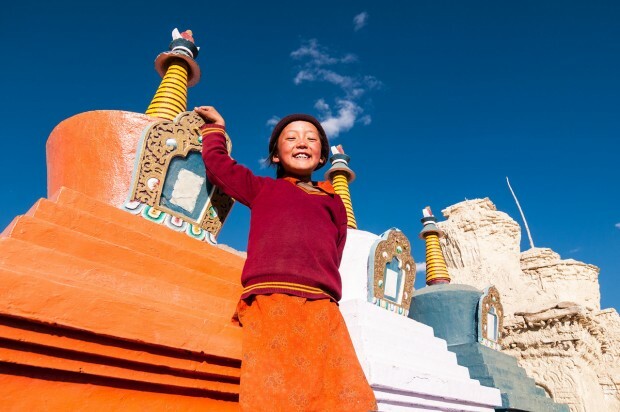 Thankfully it stopped raining the following day affording everyone the opportunity to enjoy all that the Himalayan Foothills have to offer – endless curves and an opportunity to explore some of India’s jewels that lay off the beaten tourist path. The tours being supported didn’t detract from the sense of adventure. In fact there were a few situations where it was that support combined with teamwork that made things possible. Many riders were pushed beyond their own self-imposed limits, largely due to the camaraderie those situations generated. Though none would admit it at the time, on reflection everyone expressed a sense of personal achievement they hadn’t previously thought possible. It was a joy to be involved in such teamwork and to be able to offer just a little insight into my own life on the road. Sharing experiences both past and present was a big part of the tours and with the average customer age hovering around the mid-fifties there was no shortage of experience and stories to share. 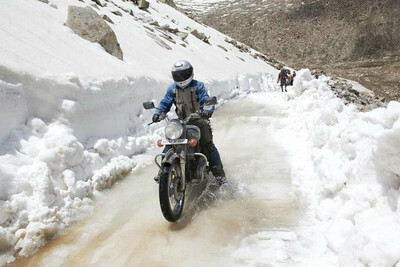 For several of the first group it was their third attempt (with different companies) to get to Khardung La, their previous attempts being thwarted by the weather. It was a pleasure to share the joy those felt at finally achieving what they’d dreamed about for years. Some arrived with no off-road experience and surprisingly limited on-road skills. Thankfully though they were all prepared to listen and learn and it was great to see those riders evolve and gain confidence over a relatively short period of time. Waving goodbye to customers knowing they were returning home better riders than when they arrived was very satisfying. I can’t finish off without mentioning the bikes. Who would believe that a 50 year old design with 20hp could cope with all that was thrown at them AND be great fun to ride. I looked forward to throwing my leg over my bike every morning and thanks to the excellent preparation by Jamal and Ramji it never let me down, no matter how hard I rode it. Pushing the limit of a small bike has always been more rewarding than tickling the throttle of a large capacity performance bike as you have to think and plan more to keep your momentum and get the most from the bike. It teaches you skills that (I believe) make you a better rider. My Indian Summer was a fantastic experience that I enjoyed every minute of and as a result I will be returning to work with Blazing Trails at the end of the year. I returned to the UK in early October in the hope of landing some work with my previous employer that would see me through until Easter 2013. After 6 years on the road I have a lot of kit that needs replacing, the preparation of Rosie’s replacement to finance and an extremely depleted savings account. Unfortunately work didn’t materialize as I’d expected. However, I am fortunate to have some very good friends and one of them stepped in with an offer of enough work for me realize my travel plans for 2013. That offer though wasn’t in the UK and so after just a few weeks I was back on a plane. Thanks for updating. Be interesting to see what Bike you pick next. GREAT story! As always your beautiful pictures make it so much more! Keep up the good spirit, and keep posting in 2013! Yes indeed, great story! Fancy seeing Maartin and Ilse’s comment here. Dale and I are back in the UK for a few short weeks. Hope to catch you all one day, maybe our next visit. Ah…the Global Village. If you’re down south and fancy a beer let me know! We’re down in Surrey visiting my brother and family, but only for one night. If you’re nearby or on the way, we could catch a (very) swift one, it would be tremendous to see you. Hi Adam, looks like you had a good time being a tour guide, look forward to your new journey. Rod T.
Great writeup, glad to have ridden with you watching over us, keep taking the good bacteria. Pongo. Ahhhhh….”Doctor Good Bacteria”….I’d forgotten about that. Cheers Pongo! Great article about a great area Adam, I plan to return this year. About BLOODY time you updated the WORLD on your travels… we were all beginning to think you were retiring (WTF do we read now ?) scenario !! Keep this up and I will be booking a place on an upcoming Indian tour ! Cheers and lots of BEERS ! Geoff & Gus (currently swanning it by the beach in Peru). Hi Adam,This is Gus(Geoffs partner) sounds like an amazing time and I have told Geoff this should be his next trip,Bloody lazy Aussies,we aint all like that,Have fun mate as I’m sure you will.GM has opened my eyes to world travel and returning home soon to save funds for my next trip.Cheers and safe travels( I’m bludging in Peru) Gus. as always an inspiring read…. Hi Adam, great read though I know most of that from our last meet, but nice to have some piccys to accompany. Keep the shiny side up, chum. very nice, one more time………and fabulous pics…..we love it…. Greetings from Australia. I have just read your latest chapter, wow! We were hoping you would be in the UK in May this year as Wayne and I will be there from May 30 till July 11th and were hoping to catch up. Our son Owen is currently living in Cardiff Wales so we are visiting him. Do you have an email address for Tim? Get back if you can as we would love to hear from you. Good to read all this! Keep up the challenge! I am off to Malaysia in two weeks to continue my trip there. Bike is in a container out of Buenos Aires at the moment! Yes, small world eh? I met Kev in Nepal back in 2006. Mexico eh? I had a great time there but 4 months wasn’t enough!!! Enjoy. Great read Adam… You’ll have to be updating now though, what with muppets missing ‘planes and all!